Education Minister Naftali Bennett slams Israel's 'armchair critics' following wave of mortar attacks on Israeli towns. 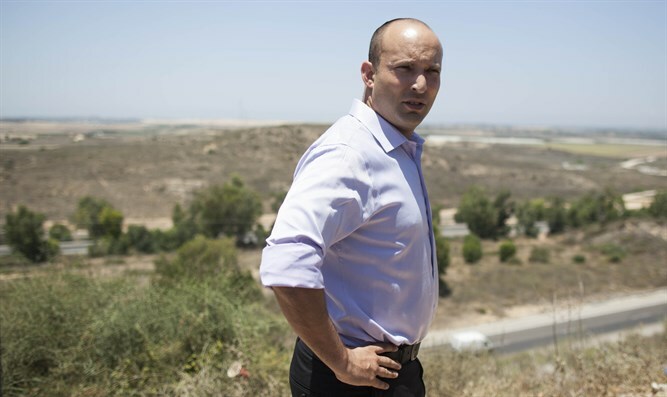 Education Minister Naftali Bennett (Jewish Home) slammed critics of Israel’s policies vis-à-vis the Hamas-ruled Gaza Strip on Tuesday, pointing to a string of mortar attacks on Israeli towns near the Gaza border. On Tuesday morning, a barrage of mortar shells were fired at Israeli towns near the Gaza Strip. At least 25 rounds were fired into Israeli territory, prompting Israel’s Iron Dome missile defense system to activate and open fire on the incoming projectiles. While most of the mortar shells were intercepted, one shell landed just outside of a kindergarten in the Eshkol Regional Council. No injuries were reported in the attack. Shortly afterwards, Minister Bennett tweeted his response to the attacks, mocking “armchair critics” of Israel’s defense policies. “For the sake of Israel’s armchair critics, here’s an official update this morning from the local Israeli municipality neighboring Gaza Strip: A rocket [from Gaza] hit a kindergarden [sic]. No children were there at the time. Studies will take place as usual today." "Now preach [to] us,” Bennett concluded sarcastically. Since March 30th, terrorists have attempted to infiltrate into Israeli territory from the Gaza Strip, with mass rioting along the border fence and multiple attempts to damage or destroy sections of the barrier separating Israel from the Hamas-ruled Strip. Israeli forces defending the border repelled tens of thousands of rioters attacking the security fence over the past two months, killing roughly 120 terrorists and violent demonstrators.